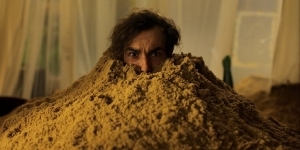 The Sandman is a new comedy from Switzerland about a guy whose body literally starts to deteriorate and turn to sand like some sort of demented hourglass. I don't know about you, but I've felt like that before. It is directed by Peter Luisi and is starting to premier at fests in Europe. One fine morning, Benno finds sand in his bed. While he tries to ignore this at first, he soon must realize that he himself is loosing the sand. Day after day the sand increases and soon his time literally starts running short. Finally he is left no chice but to ask Sandra for help, who runs a coffee shop under his apartment. Although Benno hates her with a passion, he started having dreams of her every night. What could Sandra and the dreams have to do with the sand? Check out the trailer for The Sandman after the break.